The QualitySpec® 7000 process spectrometer is ideal for measurement of process materials transported on conveyance systems. The system is designed for continuous measurement of solids, powders and blended materials, providing multiple measurements from a single point. The system easily integrates into your process, delivering full-range, instantaneous measurements. All data is communicated via high-speed Ethernet and is easily accessible over an OPC server, simplifying data integration. The QualitySpec 7000 analytical system is comprised of a control cabinet and optical head. 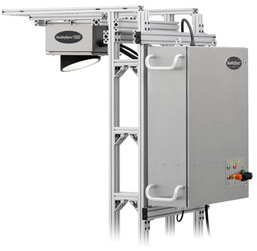 The compact optical head mounts over the conveyor and uses a safe quartz-halogen light source for consistent reliable measurement. The reflected signal is transferred from the optical head to the spectrometer through a fiber optic cable. 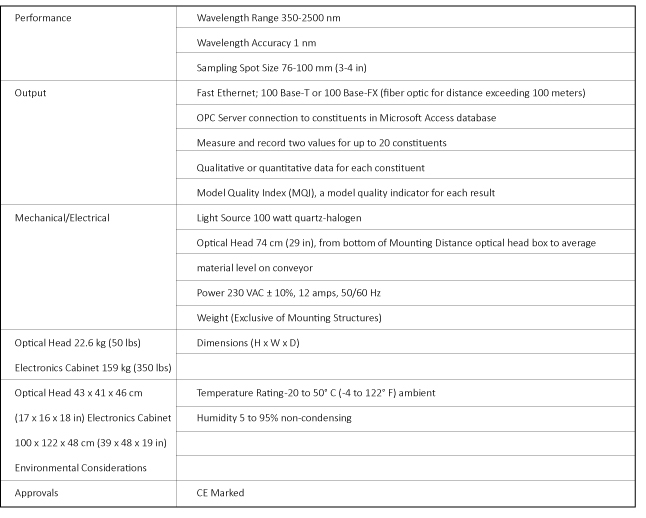 At the core of the QualitySpec 7000 is the Goetz spectrometer module which covers the Vis/NIR spectral region from 350-2500 nm. Enclosed in a ruggedized stainless-steel enclosure, the system can withstand some of the most extreme process environments from dusty mills to remote rock quarries. Integrated heaters and air conditioning allow the unit to operate efficiently across a range of temperatures from -20 to 50oC (-4 to 122oF). For more information on the Quality Spec 7000 please visit our Knowledge Center.